Anthems are a powerful thing. Everyone has at least one that brings them back to days of carelessness and debauchery, paths not taken and drunken mistakes. Hull punk band, Less Deceived drop five more to make you throw your fists up and scream your lungs out with their new EP, ‘It’ll Never Get Better Than This’. Making an impact with a five track EP can prove to be a challenging task for some bands, but Less Deceived meet the challenge with no shortage of power chords and honest, heartfelt lyrics. 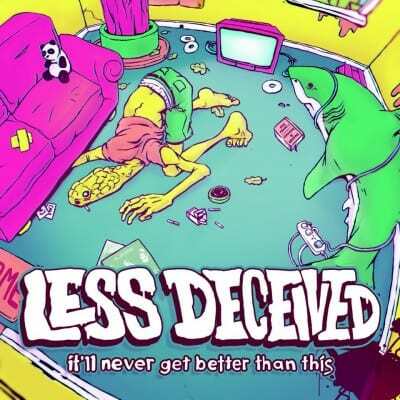 Comparable to the likes of The Wonder Years and The Loved Ones, Less Deceived have a talent for drawing together memorable melodies and conscientious lyrics over a powerful punk sound. The EP kicks off in style with ‘Not you, Naan Bread’, bringing roaring vocals and anthemic chords together to set the bar for the remainder of the tracks. Continuing to carry that energy through the EP, ‘This Dragon’s A Gentleman’ is a methodical track driven by dynamic drums and an impressive vocal range, adding unique dimensions. With a repeating statement of ‘I hope it gets better’ the relatable lyrics emerging through each track, add an extra element to an already beloved punk sound. An effortless sounding confidence is brought out in ’20.04.13’ with introspective lyrics to bring an unrivalled potency to the track. The pairing of a single guitar with lead vocals, complimented by backing vocals and harmonies brings a raw, heartfelt and emotional factor to the song while maintaining an upbeat, rocking pace. The EP’s standout track for us is without a doubt ‘No Takesy Backsy’. Acting as a sort of ‘super anthem’, ‘No Takesy Backsy’ starts with crooning guitars mimicking a vocal melody, followed by a declaration of ‘This is the sound that’s calling you home’. The band’s use of group vocals on this track bring it full circle. As the verses bring speed to the track, the song contains every positive element of punk rock at its finest. Bringing the perfect close to the EP is the mighty ‘A Seafaring Metaphor’, a powerful track that ends the collection on a very high note. ‘It’ll Never Get Better Than This’ is a relentless offering from Less Deceived, filled to the brim with substantial, classic punk tracks and an attitude to match.